A Handwritten Modern Classic by Finola Moorhead. Spinifex Press 2013. (First Published by Post Neo Books 1982). 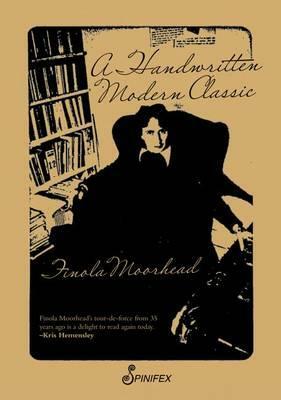 I must have read Finola Moorhead’s A Handwritten Modern Classic just after it was published in 1982. It was one of those books that you never forget. It was handwritten not typed. I had to relearn how to read this book. I started as if this was just another book but by the second paragraph I had tripped over words and landed flat on my face. Finola’s handwriting is not that hard to read (compared to mine for example) but I had to approach the text in a different manner, I had to read more closely, and I had to reread just to make sure… those last two letters are they ‘th’ or a strange ‘r’? Is the word “death” or “dear”? Reread the sentence…ah must be death! But once you crack the code you are in!! And it’s a wonderful place to be (whether it is 1982 or 2013!) and the Post Neo edition has held a special place on my bookshelf for decades. A Handwritten Modern Classic is a manifesto, it is (at times) handwritten poetry disguised as prose. Interestingly it still seems contemporary – Malcolm Fraser may not be PM but the issues remain the same. Above all it asks questions about writing and literature that we still need to ask today. It is exciting that Spinifex has republished this small press classic – and brought it to the attention of a new generation, a new group of readers and writers. It will be interesting to see how it is received 30 years after Pete Spence and Post Neo Books decided to publish a handwritten manifesto – a classic even then! Rochford Street Review is proud to be able to publish berni m janssen’s extraordinary launch speech for this ‘classic’ of Australian literature and is over the moon at being able to publish Finola Moorhead’s own thoughts on her classic becoming a classic! A Handwritten Modern Classic by Finola Moorhead. Spinifex Press. 2013. First published by Post Neo Books 1982. In 1977 Finola was writing the everything of her living, in her own hand, in a small notebook and this is The Handwritten Modern Classic. She was writing of her living, her thinking about her living, the thinking about writing, and writing all of this – this everything of Finola’s living at that time. I first read the Handwritten Modern Classic in the eighties, and was delighted and my delight has been re-ignited. Simone Weil says ‘attention is love’ and Finola is attending, attending to the everything of her living, and this everything so interesting and of interest, we feel Finola loving; living, thinking, writing, everything. We are immersed in this close attending of everything that is so interesting and it is in this that a present, a now, that continues to be now, is composed. In the handwritten the voice of the writer is printed. The handwriting a voiceprint. The handwriting composing the voice in a continuous present that we are reading now. And so present, that my delight continues. But, what a cheek Finola has! To name her writing a classic as she is writing it, well before she is dead. What a tongue in cheek she has! She is poking her tongue at capital H History, capital L Literature, capital A Authority and all capitalisation! Amongst other things. In 1977, feminism spoke of the personal as political, and so Finola writing the everything of her living is a political act. As a writer, thinker, feminist, lesbian, protestor, questioning, questioning the everything of living, outspoken, critiquing; this places her outside of the mainstream, on the outer. Standing on the outer is a way to look in, look at, closely. Standing on the outer, looking in, so many minute details, filter in to focus, out. Pass. She is writing of the everything of living in that time of 1977 – the politics of politics, the politics of living, the politics of thinking, of being, of relationships, of communication; thinking about and questioning the everything of living – writing, freedom, rules, roles, genius, romantics, literature, philosophy, alienation, imagination, insanity and sanity, of what is correct, of escape, of sarcasm, expression, failure, success, of barricades, a little seventies literati gos , an occasional portrait, wry observations, and of conversations with mother, lovers, friends and of speaking of language unbound in a Fitzroy laundromat. What a gritty hilarious romp it is! The only thing that is different from one time to another is what is seen and what is seen depends upon how everybody is doing everything. This makes the thing we are looking at very different and this makes what those describe it make of it, it makes a composition, it confuses, it shows, it is, it looks, it likes it as it is, and this makes what is seen as it is seen. Nothing changes from generation to generation except the thing seen and that makes a composition. Finola pays respect to her lineage. Nods to the thinkers and literary forebears: Austen, Woolfe, Simone Weil, Marcuse, Wittgenstein, Coleridge, Tolstoy, Eliot. We feel this continuity. And of course, the entire composition, more than a nod to Gertrude Stein. It’s a rigorous conversation with Gertrude’s Composition as Explanation. The Handwritten makes us laugh, sigh, groan, roar in protest, escape into, deeply, deeply into, the thinking and the imagining and the writing. As Finola says ‘imagination is best employed on what is’. I am breath-taken, breathless by the scope, the attention, the detail, and the writing – the language so wonderfully composed. Composing the everything of a living, in words elastic, precise, evocative; playing playful. A sentence being more. 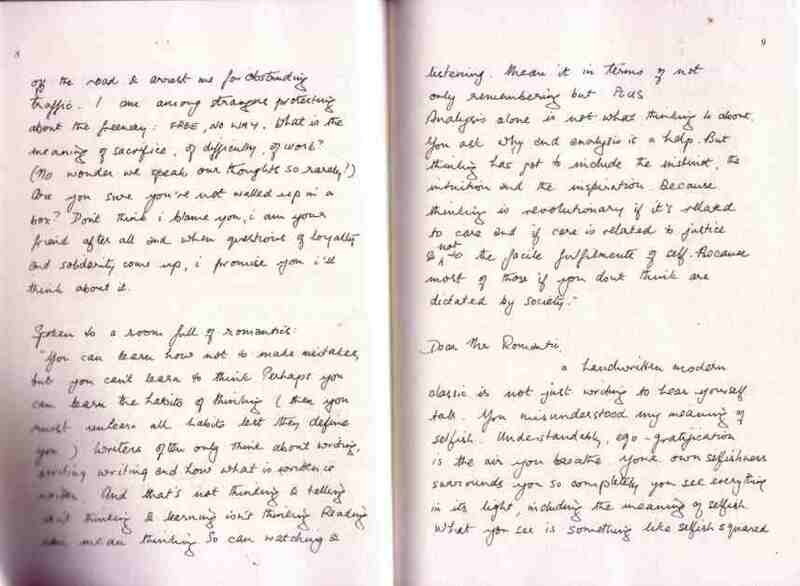 The Handwritten Modern Classic is difficult to read. We are unfamiliar now with handwriting – an idiosyncratic flow of script. Finola’s handwriting loops and lurches across the page. You must pause whilst reading to distinguish an ‘i’ or an ‘l’, one must pause in the reading of the writing, take time to be with the writing, in a way that text typed, text texted does not. We pause in the irregularity. Pause to decipher, and in those moments of pausing, we are ciphering the word, rolling it around, and the word is clarifying and as the word clarifies the sentence has formed and nestled in our consciousness. The act of ciphering the hand, makes space for the intensity of thinking, of thinking of living, of questioning the thinking of living and the writing is living with us, as close as it can be. This writing makes us stop to think, and in the pause of reading we are thinking, as Finola has been thinking through her writing of her living. She is not only thinking of how the writing is to be written but how her living and thinking of her living and her writing of her thinking of living is written. We pause in the loops of the handwritten, as we pause in the loops and twists of living, and the loops and twists and returns of thinking. We return again and again. We must start again, in reading and thinking, and reading the writing of living and thinking. As Gertrude says, writing is often not recognised at the time it is written whilst it is very contemporary and exciting, but that often it must wait some thirty years or more before it can be recognised. And this is mostly when the writer is dead. Long dead. However once it has been accepted after it has been refused, and the writing is still contemporary and exciting, this is what makes it a classic. Finola has us in her now of the living of these days in 1977. There is a freshness still, a beauty of the moment, a now that continues into now, that makes it a classic. A classic does not have wrinkles in its words, nor dust collected in the serifs. Unless placed there, with intent. Gertrude says that a classic is wonderfully beautiful, after many have found that it has been annoying, difficult, stimulating. Some see the beauty whilst it is still annoying difficult and stimulating. Others will never see beauty in such. Fresh as it was then, we are in the present of her writing of her living of everything and it is a delight, and the delight also makes it a classic. And so Finola, who with tongue in cheek, nodding to her philosophical and literary lineage, with imagination, attention and foresight wrote The Handwritten Modern Classic. She wrote this from the outer, from the other side of the law, and as Gertrude has said you are an outlaw, until you become a classic. As I was reading, I was noting so many lines, sentences, thoughts that delighted me and that I wanted to quote -so many hilarious quotable lines that I wanted to share, to sprinkle through these launching words, but they became so thick, I may as well have read you the book, so better you buy it and trip with this handwritten, pause in its stimulating difficult beauty, living in the writing of the living and the thinking of the living and the writing of the everything. Buy this book, so that you can begin and begin again, for the continuing delight of it. Gertrude would be well pleased with this classic composition! 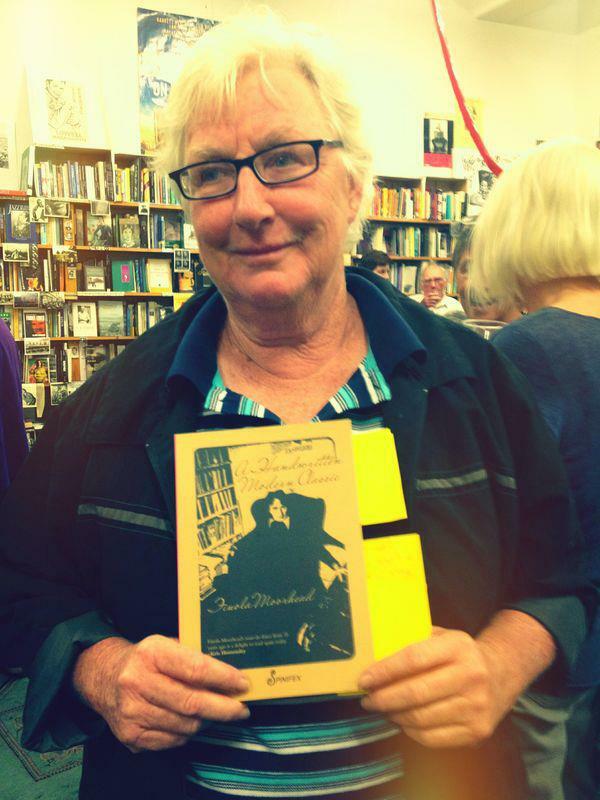 Finola Moorhead at the (re)launch of A Handwritten Modern Classic – Collected Works Bookshop Melbourne. Notebooks with mock leather covers, looking like a Reader’s Digest edition of the Complete Works of, say, Thomas Hardy, called, I think, “modern classics”, were sold in newsagents. There were neither lines nor words within. Di Wilson gave me one. She had suffered me writing my first novel, Lots Of Potential. I have an elusive memory-feeling that this notebook was an ironic present. Di shared with my mother a rich vein of sarcasm. I play those curly balls with a straight bat. I do, and being a sportswoman, I know what I mean. Being a sportswoman never ever sat with the full package of “being a writer”. Being a writer meant that you were an indoorsy person who read well and didn’t mind the sound of your own voice. My voice does not have a particularly pleasant timbre. Like the disappointing image in the mirror, the sound of my voice on radio makes me recoil blushing and rushing outside to hit a ball. Hitting a ball with a straight bat means, when metaphorically referring to a response to sarcasm addressed to myself, is nodding and seriously doing what is sardonically suggested, that is, stepping to the pitch (for those ignorant of cricket = where the ball bounces) to disempower the spin, not aggressively trying to whack it for runs. But whack it for runs, it seems, is what I have done. Ania Walwicz said to Kris Hemensley some time between 1972 and 1977 about me, “Who can believe a writer in a tracksuit?”, a little thing I have remembered all these years because she nailed my problem. What the f*ck am I doing pretending to be a writer when I don’t look/act/seem like one? .Forty years on I reckon I know what would have ensued had I been believable in the sense that Ania meant. I don’t think I have to explain that to readers of the Rochford Street Review, but I really don’t mind not being invited to speak and read at Writer’s Weeks or Festivals, judge literary prizes, give my opinion on the best books written in a given year, teach creative writing, hunger for residencies, grants and so on. So much of that is what you seem, not what you are, or what you wrote exactly. It drove me mad and it does drive me crazy when I am interviewed by someone who has not taken the time to read what I’ve written enough to understand or appreciate what I did. What I did in terms of literature is important to me; the how, where, why of the what. What my sportswomen-friends read is not what I write, though, dear literary folk, they do read, a lot; an amazing amount. Their opinions are fierce on who is best, better and good; they are talking about plot. Plot is what I am not good at, though I do try. What I love is how a story, or feeling, or insight, or record unfolds, how the writer explains and describes. I love structure, form, philosophy subtley embedded in metaphor, symbol and action. What literary writers like is language, and I love them for that, but English for me is like a second tongue even though I have no other. That, ironically, is why I am a writer. Kris Hemensley, forty years ago, like he is now in owning Collected Works, was a person as place. He was where we who wanted to explore the possibilities of writing gravitated as villagers might gather and chat at the well; outside the establishment, the houses and offices of standards where stamps of approval were given in relation to accepted, tried and true values of literature as taught in universities and schools. He gave Melbourne its avante garde in the literary genre by being open and versed in what was being done in England, America and Europe in the moment of the 60s and 70s, and publishing new work in any way he could. I was lucky enough to visit that well and drink from its licence. So freed from being a short-story writer, or playwright, — my poetry was always over-blown and declamatory – I could set about writing “writing”, as we called it at the well. What was verse? What was prose? Was it grammatical? Did punctuation matter? These were good questions. But I don’t think I ever really “got it”, which means I had a fundamental problem with post-modernism. Women’s Liberation had thrown a spanner in the works in that, suddenly, the track-suit (even though I didn’t own one) made sense to other people, women. So by 1975 my image fitted in with a mob while my writing could develop in another intellectual direction. By 1980 I had worked out that I could write fiction with a female aesthetic using the allowances afforded me by being for a short while in the company of men who were writing great stuff which changed literature for the rest of the century. In between these two was the serendipitous gift of a notebook and the writing in 3 weeks in 1977 of A Handwritten Modern Classic whose first edition has a print-run of one. For all those apparently sane people who collect things, especially rare books this one is the very definition of unique. Start bidding. In 1985 it was published by Pete Spence, who opted in his concrete-poetic way to keep the hand-writing. When Spinifex Press brought out the hard copy for their e-book publication of it this year, I read my “classic” again and it’s cute, it’s crazy, it’s readable; it is the picture of a thirty-year old’s mind, which I recognise as mine. How little we change! How much we change! We can never have that opinionated energy again; a certain sort of poetry is ever youthful. By poetry I mean a delightful marriage of words, fresh, like the first taste of an avocado; an experience of literature which feels like teenage love. Maybe the wearing down of the sandstone, aging, can result in something sculpturally nice; the sharp edges of criticism smoothed by the wisdom that one must accept that people need their illusions, their ideals now not much more than words spoken, that tolerance is a part of the caution we have learnt to survive, we are more circumspect with what we commit to paper. The re-issue of A Handwritten Modern Classic has brought home to me the importance of being true to your age, when putting thoughts into words for others to read.